Women novelists used fiction to promote a variety of progressive social agendas. Clementina Black was a suffragist and trade unionist who campaigned to improve industrial conditions for women. She was a co-founder of the womens Labour Bureau, which led to the formation of the Womens Industrial Council in 1894. 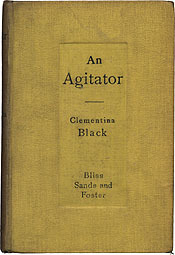 Black wrote seven novels, including this one about a socialist strike leader. Clementina Black. An Agitator. London: Bliss, Sands and Foster, 1894.